BlackBerry PlayBook price: how much would you pay? What's RIM's new tablet worth to you? BlackBerry PlayBook price: what should it be? 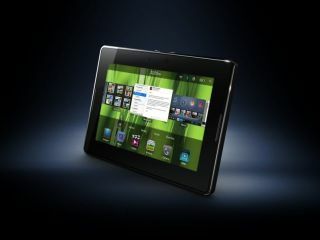 BlackBerry has announced its new tablet, the BlackBerry PlayBook. Set for a UK release date of "before summer 2011" in the UK, the PlayBook features a 1GHz dual-core Coretex A9 processor, 7" capacitive touchscreen with a 1024 by 600 widescreen resolution, dual HD cameras, Wi-Fi and Bluetooth. There's 1GB of RAM and a choice between 16GB or 32GB of storage. But RIM hasn't yet announced the PlayBook price. So how much would you pay? Let us know in the comments.